The decades of the neighborhood theatres can be divided into two distinct groups: the Interstate theatre chain and everything else. All the major releases and first-runs were channeled through those theatres with affiliations to the major studios, while the independents had to settle for the leftovers. 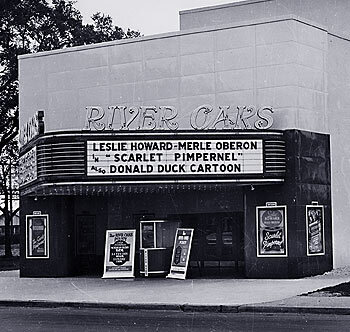 Most of the top films were sent directly to the big downtown theatres, but as Interstate expanded its theatre line, the first-runs would find distribution into the various Houston neighborhoods. Beginning with the 1935 opening of the North Main Theatre, Interstate would sweep across the city, building over ten theatres over the next 12 years. With the onset of the Great Depression, the building of grand movie theatres ot the twenties came to a halt. By the time theatre construction resumed in Houston, the rules of the entertainment game had changed dramatically. Silent films died out with the previous decade. Those theatres that did not convert to new sound technology simply closed down. The ornate grandeur of the pre-depression picture palace evolved into a new, streamlined architectural style, which would become stereotypically associated with the movie theatre concept forevermore. Massive theatres were replaced by smaller, more intimate structures. Gone were the atmospheric cloud-and-stars ceilings, Egyptian temples, Roman statuary and flourishes, opulent marble interiors, live orchestral accompaniment, Wurlitzer organs, full vaudeville programs, ushers in uniform, and 2,500-seat auditoriums. Geography played a part as well; as the city continued to expand, the distance to the downtown hub also increased. The culmination of Houstons growth gave rise to theatre construction in the Houston suburbs  the neighborhood theatre.